FOB Sabit Qadam—The Sangin district of Helmand province once was known as one of the most combat-intensive regions in Afghanistan. The gains made in the area—pushing the insurgents back and making the region more secure for civilians—proved costly in Marine lives, particularly during 2010 and 2011. 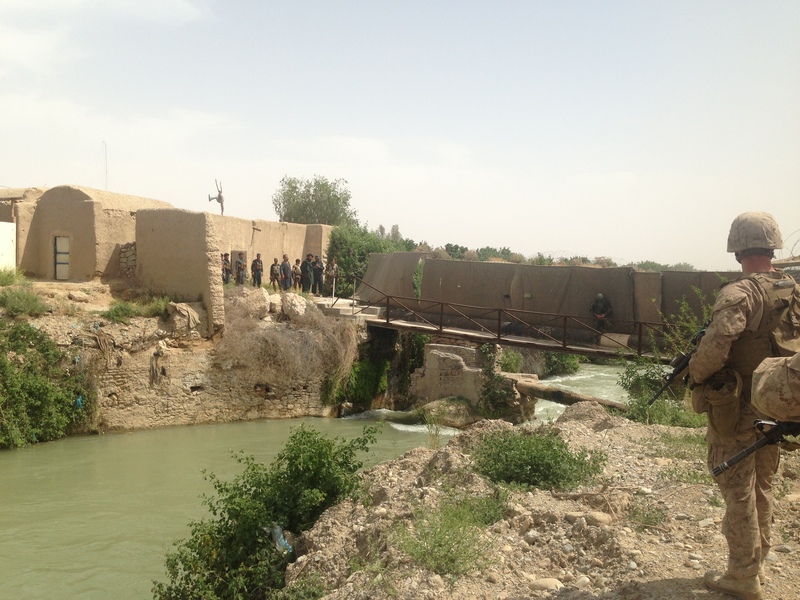 Three years later, while the Taliban do still maintain a presence here, it’s now the Afghan National Security Forces who patrol and engage with the enemy, as is the case throughout Helmand province. The Marines still remaining here, a contingent of fewer than 300 from Charlie Company, 1st Battalion, 7th Marines, are tasked with drawdown operations for the outpost and providing security. At an outpost where Marines once awoke to machine gun fire overhead, some now look forward to the chance to get outside the wire at all. Lance Cpl. Alan Lucas, who stood post at a lookout point facing the Helmand River, said he had been on one patrol since arriving at Sabit Qadam earlier this spring, going less than a hundred yards outside the wire to assess damage to a bridge across the river to assess damage after some heavy flooding. Lucas said his first deployment has been quiet for the most part, except on election day when he observed enemy rocket fire aimed toward the regional polling place. While most of the rockets were duds, he said, one did explode near a FOB lookout point further down the river.